Sarah Bishop had a commitment to Camp Adams. First as a camper, then as a counselor and director, and finally as a member of the camp's program staff, Sarah spent many summer days alongside Nate Creek and Milk Creek. She had explored and hiked all of the 210 acres of the camp and could show a long-time camper (and some Conference staff persons) many places of beauty never seen or too often overlooked. Sarah loved the campers and the campers loved Sarah. She worked wonders with campers who were having a difficult time fitting into the camp community. She wouldn't let homesickness send any camper home if she could help it. Her presence was almost always one of quiet care and listening, letting the campers know that she cared about them. But when she chose, she cold enliven any camp fire. She was the epitome of what a camp counselor/director should be. 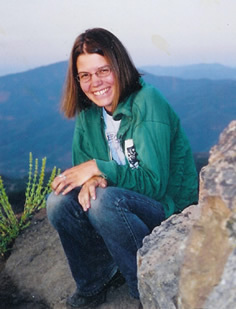 Last August, Sarah, doing what she loved to do—hiking, lost her life in an accident on Mount Hood. To honor all that Sarah embodied, camp friends have created the Sarah Bishop Campership Fund. This fund will be used to provide campership help to children and youth from the Portland area who would not be able to meet the costs of a week at camp but would benefit from time away from the city in the forested setting of Camp Adams. Persons who would like to contribute to the Sarah Bishop Campership Fund can do so by sending their checks to the Conference office marked "Sarah Bishop Campership". News from the Churches of the Central Pacific Conference is published jointly with the United Church News by the Central Pacific Conference of the United Church of Christ, 0245 SW Bancroft Street, Suite E, Portland, OR 97239. The Rev. Hector E. Lopez, Conference Minister; Rev. Eugene Ross, Conference Minister; Elaine Clark, Editor; D. Lynn Walser, Webmaster. Copy may be mailed to the Conference office or emailed to pdxwordsmith@comcast.net by the 5th of odd-numbered months for publication the following month.